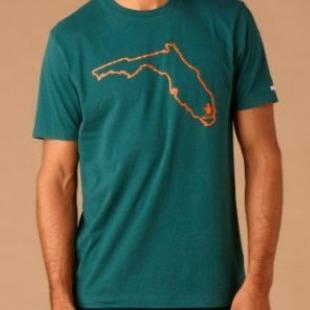 This classic pine-colored cotton tee rocks an orange outline of Florida, and represents the 305 by plopping, right over Miami, a logo containing the brand's signature flightless bird: an ostrich. Just kidding, it's an emu. Just kidding again! Oh man, this is too much. Anyway, it's a Penguin.